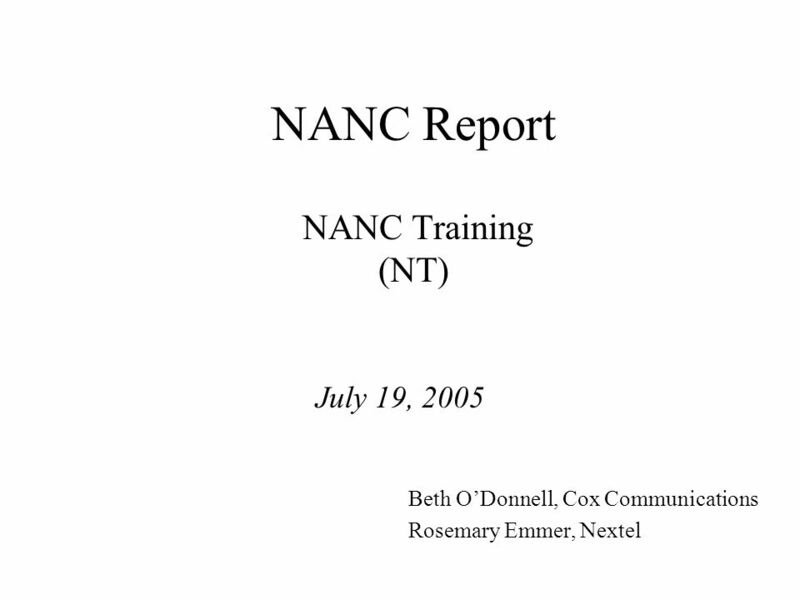 NANC Report NANC Training (NT) July 19, 2005 Beth ODonnell, Cox Communications Rosemary Emmer, Nextel. 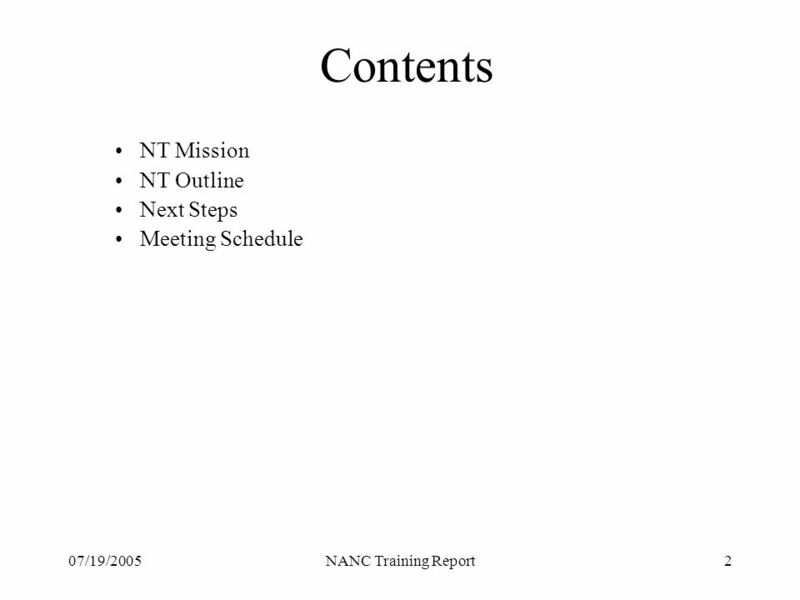 3 07/19/2005NANC Training Report3 NT Mission Contents The mission of the NANC Training (NT) ad hoc committee is to work collectively with the NANC members to develop a brief yet cohesive training document. 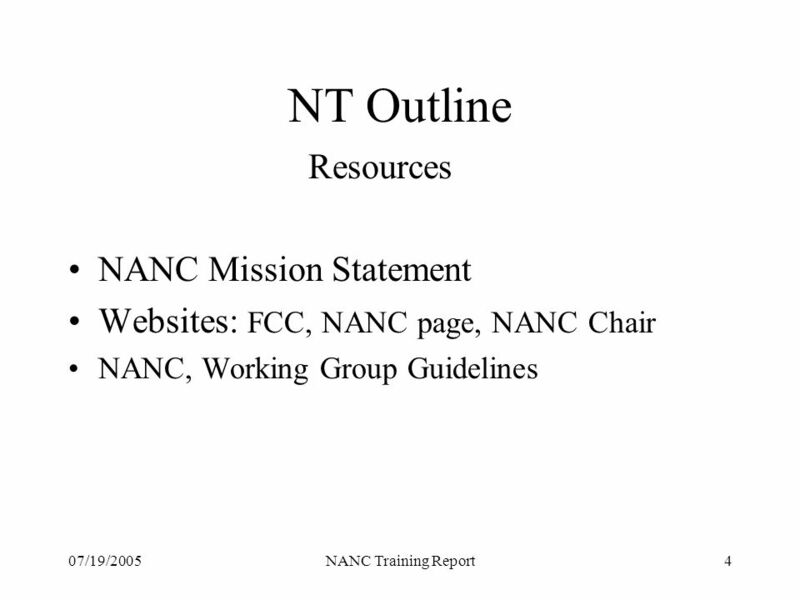 This document will be delivered to the NANC members. 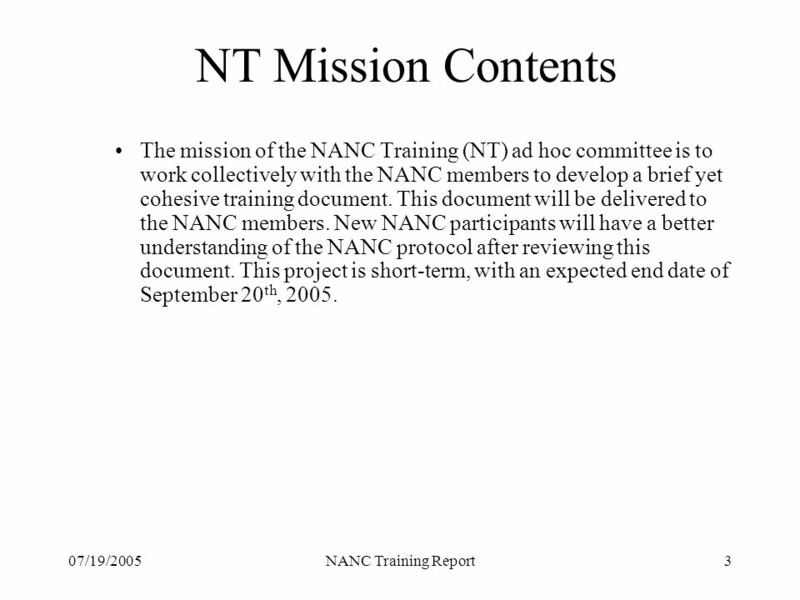 New NANC participants will have a better understanding of the NANC protocol after reviewing this document. This project is short-term, with an expected end date of September 20 th, 2005. 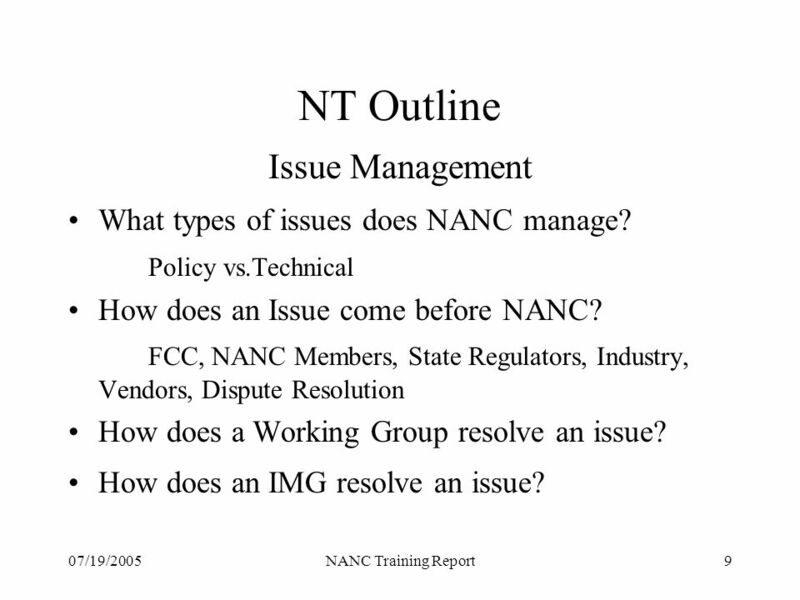 9 07/19/2005NANC Training Report9 NT Outline Issue Management What types of issues does NANC manage? Policy vs.Technical How does an Issue come before NANC? FCC, NANC Members, State Regulators, Industry, Vendors, Dispute Resolution How does a Working Group resolve an issue? How does an IMG resolve an issue? 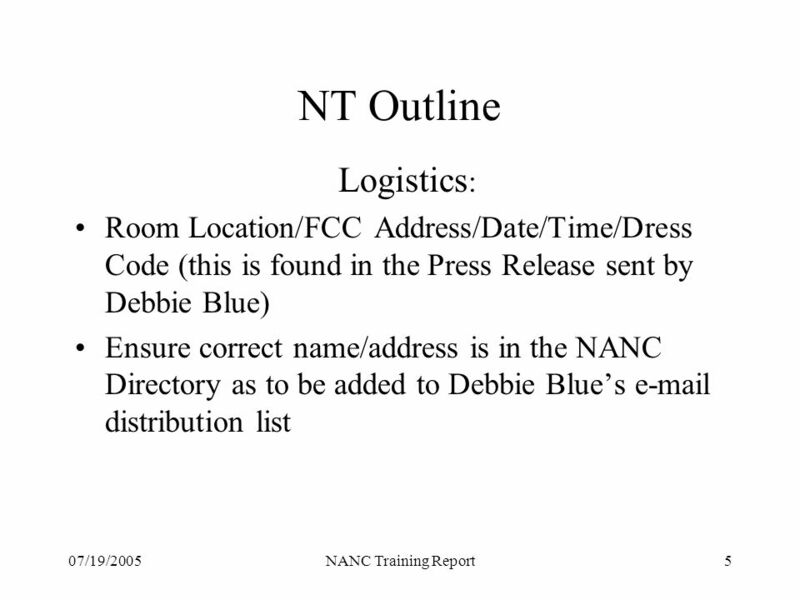 Download ppt "NANC Report NANC Training (NT) July 19, 2005 Beth ODonnell, Cox Communications Rosemary Emmer, Nextel." NANC Report Numbering Oversight Working Group (NOWG) May 13, 2003 Co-Chairs: Karen Mulberry, MCI Jim Castagna, Verizon. 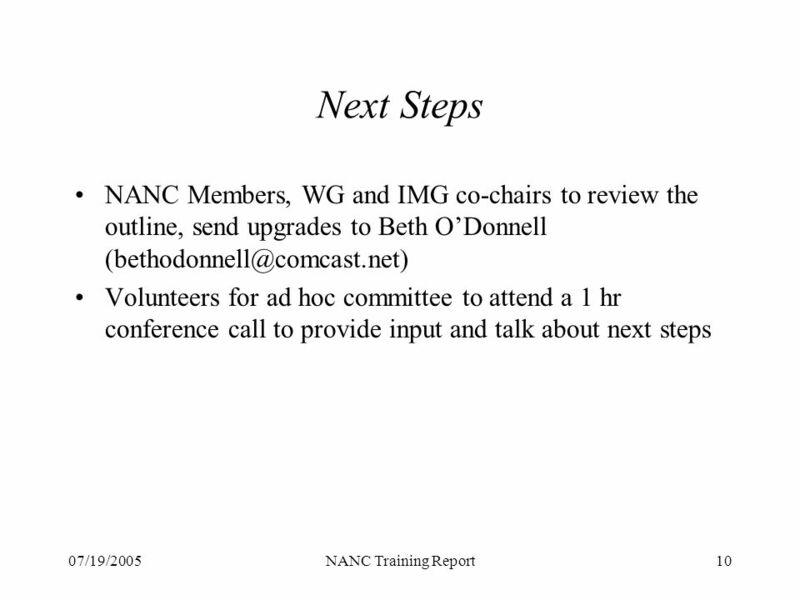 NANC Report Numbering Oversight Working Group (NOWG) March 15, 2005 Co-Chairs: Rosemary Emmer, Nextel Karen Riepenkroger, Sprint. NANC Report Numbering Oversight Working Group (NOWG) July 13, 2004 Co-Chairs: Karen Mulberry, MCI Jim Castagna, Verizon. 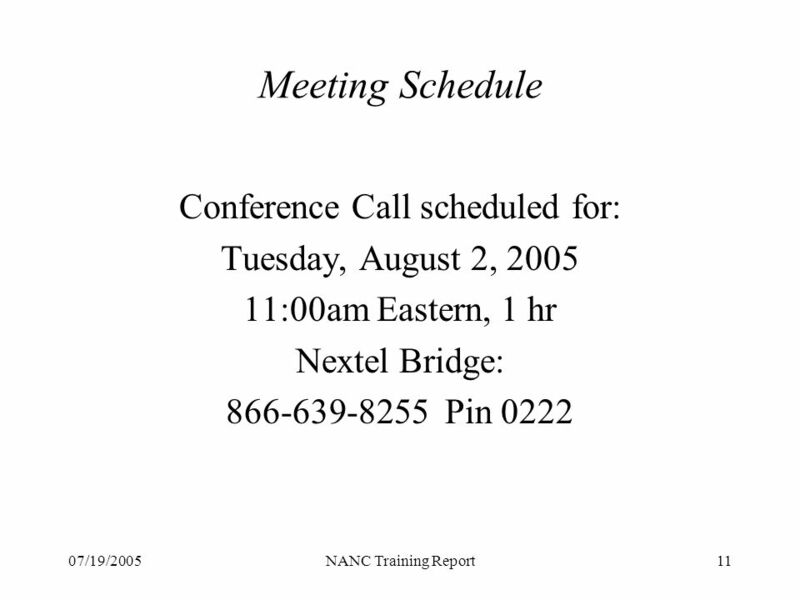 NANC Report Numbering Oversight Working Group (NOWG) July 15, 2003 Co-Chairs: Karen Mulberry, MCI Jim Castagna, Verizon. NANC Report Numbering Oversight Working Group (NOWG) September 25, 2003 Co-Chairs: Karen Mulberry, MCI Jim Castagna, Verizon. NANC Report Numbering Oversight Working Group (NOWG) October 22, 2010 Tri-Chairs: Laura Dalton, Verizon Communications Natalie McNamer, T-Mobile USA Karen. North American Numbering Council Billing & Collection Working Group (B&C WG) October 10, 2007 Co-Chairs: Rosemary Emmer, Sprint Nextel Tim Decker, Verizon. 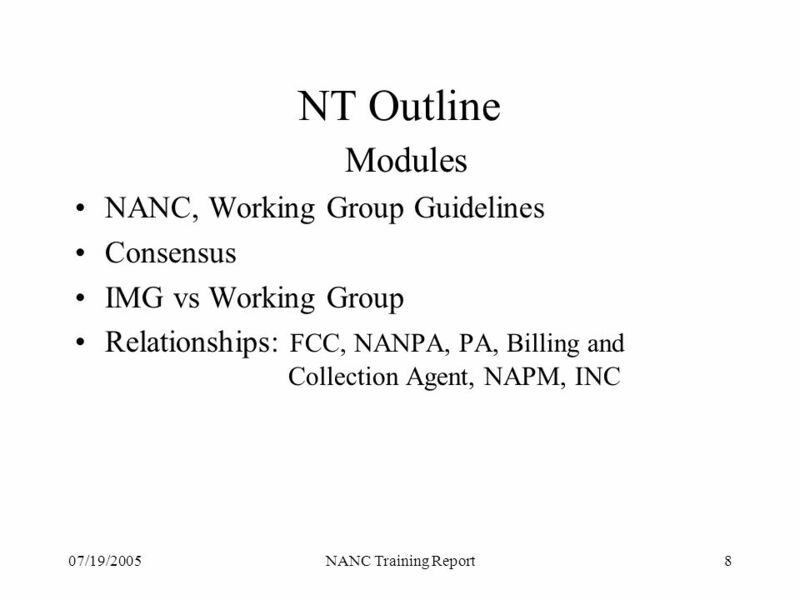 North American Numbering Council Billing & Collection Working Group (B&C WG) February 13, 2007 Co-Chairs: Rosemary Emmer, Sprint Nextel Tim Decker, Verizon. Cost Recovery Working Group NANC Report Billing & Collection Working Group (B&C WG) January 19, 2005 Co-Chairs: Rosemary Emmer, Nextel Jim Castagna, Verizon. NANC Report Numbering Oversight Working Group (NOWG) September 14, 2004 Co-Chairs: Karen Mulberry, MCI Jim Castagna, Verizon. NANC Future of Numbering (FoN) Working Group July 19, 2005 Co-Chairs Hoke Knox, Sprint Karen Mulberry, MCI. Number Optimization Working Group (NRO-WG) Report NANC Meeting Washington D.C. September 19, 2000. North American Numbering Council Billing & Collection Working Group DRAFT November 30, 2006 Co-Chairs: Rosemary Emmer, Sprint Nextel Jim Castagna, Verizon. NANC Report Numbering Oversight Working Group (NOWG) February 18, 2010 Co-Chairs: Laura Dalton, Verizon Communications Natalie McNamer, T-Mobile USA Karen. NANC Report Numbering Oversight Working Group (NOWG) October 15, 2009 Co-Chairs: Laura Dalton, Verizon Communications Natalie McNamer, T-Mobile USA Karen. 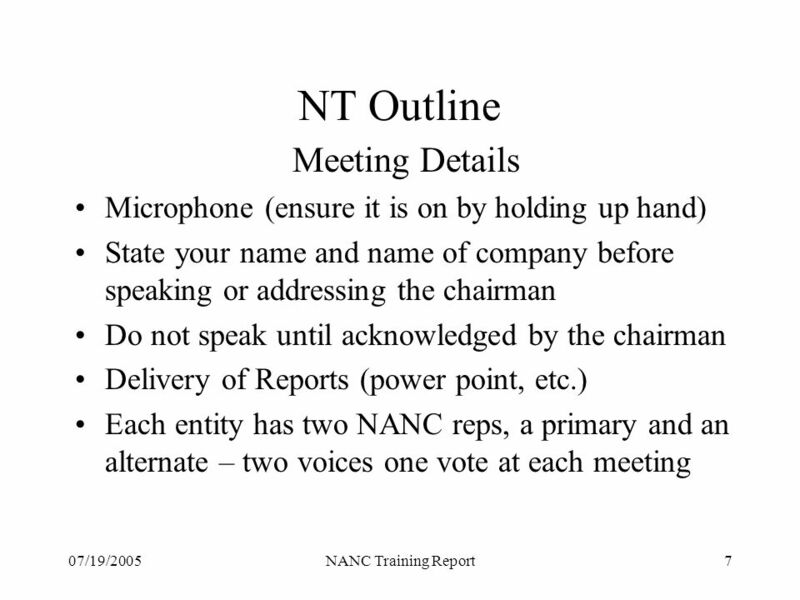 NANC Report Numbering Oversight Working Group (NOWG) March 19, 2003 Co-Chairs: Karen Mulberry, WorldCom Jim Castagna, Verizon. 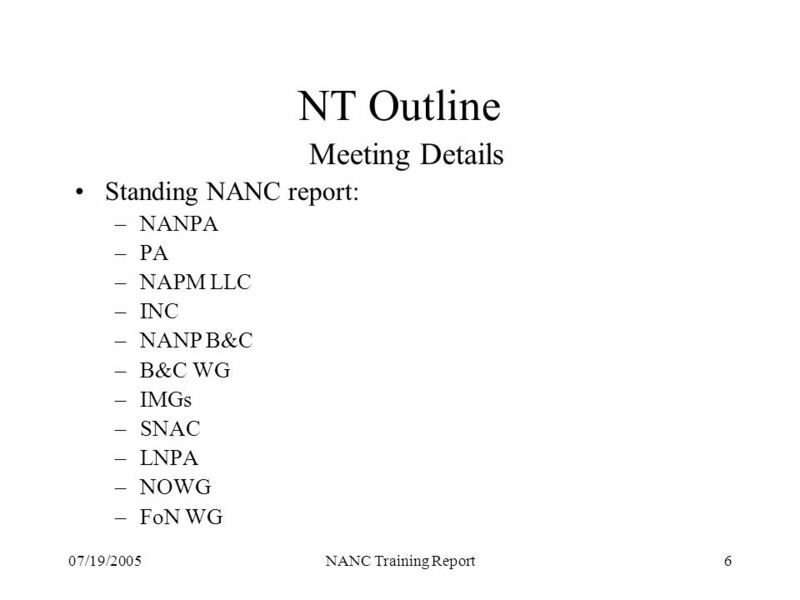 INC Report to the NANC – September 20, Industry Numbering Committee (INC) Report to the NANC September 20, 2005 Ken Havens - INC Chair Adam Newman.